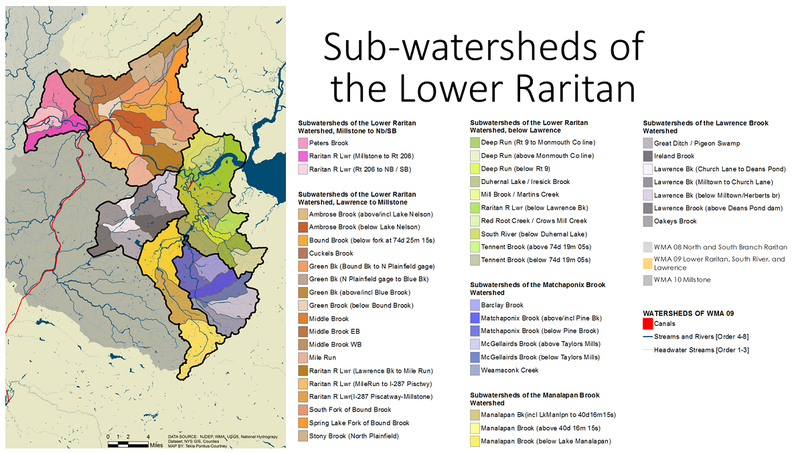 The Lower Raritan Watershed (LRW) /Watershed Management Area 9 (WMA9), is part of the larger Raritan Basin. These major HUC-11 watersheds are further divided into forty-seven sub-watersheds, called HUC-14’s (based on their 14-digit hydrologic-unit code). These HUC-14 sub-watersheds are generally 2-15 square miles and made up of the convergence of two second order streams as well as often a third order stream system. HUC-14s are the unit by which the New Jersey Department of Environmental Protection (NJDEP) evaluates stream ecosystem health based on impervious surface coverage, and the unit by which Watershed Management plans are typically developed. Started during the Fall 2016 semester, the Rutgers Environmental History classes will develop an environmental history report of one HUC-14. Class activities include research into e.g. historic maps, toxics legacies, demographics, and historic ecology (flora/fauna) of the area. For Fall 2016 and Spring 2017 the HUC-14 is the Lower Raritan River between Lawrence Brook and Mile Run. Here is a sample of maps found for the Lower Raritan River between Lawrence Brook and Mile Run. *Watershed and sub-watershed boundaries are based on elevations and water courses from 1:24,000-scale (7.5-minute) USGS quadrangles.